CobaltFx is an unprecedented approach for millimeter-wave S-parameter measurements in three dedicated waveguide bands, 50-75 GHz, 60-90 GHz and 75-110 GHz. 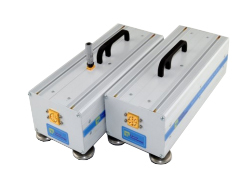 The system is anchored by C4209 a 9 GHz Cobalt Series USB VNA and features frequency extension modules from Farran Technology and a precision calibration kit. 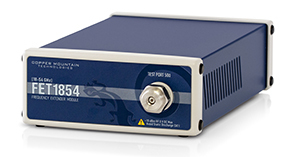 [ENG] The CobaltFx 15 system features Cobalt series C4209 VNA, frequency modules from Farran Technology in the waveguide band of 50-75 GHz and a precision waveguide calibration kit. This system has a dynamic range of 120 dB tup. at 10 Hz IF bandwidth. [ENG] The CobaltFx 12 system features Cobalt C4209 VNA, frequency extension modules from Farran Technology in the waveguide band of 60-90 GHz and a precision waveguide calibration kit. This system has a dynamic range of 110 dB typ. at 10 Hz IF bandwidth. [ENG] The CobaltFx 10 system features Cobalt Series C4209 VNA, frequency extension modules from Farran Technology in the waveguide band of 75-110 GHz and a precision waveguide calibration kit. This system has a dynamic range of 110 dB typ. at 10 Hz IF bandwidth. Il Copper Mountain FET1854 può lavorare con uno dei modelli Cobalt C4xx 9 e 20 GHz, 2 o 4 porte per avere un sistema completo fino a 54 GHz. Lo stesso strumento può essere collegato ai frequency extender già disponibili per coprire frequenze fino a 110 GHz. I frequency extender della serie FEV ampliano le capacità degli analizzatori di rete VNA inmodo da poter condurre misurazione dei parametri S dell'onda millimetrica in banda W.